You may be sick and tired of colleagues in your office or couple kitty or spouse’s friend’s spouse, who just got their kid admitted to a school in town, telling you how great that school is! They must be going gaga about the infrastructure, teacher, swimming pool and the ratings about that school in Hyderabad. They feel that they are doing a kind deed for you with their opinions, but only you know much more confused you are right now from what you were a week back! Finding the best schools in India for your child is a sensitive decision to make, on that will forever affect your child’s future. · Gitanjali School – This institution is known for its academic rigor and offers value-based education. It also has a unique blend of academics teamed with complementary co-curricular activities. · Vidyaranya High School for Boys and Girls – This school is known for its cultural and traditional dominance while also being famous for being one of the oldest educational institutions of Hyderabad. · Chirec Public School – This school offering CBSE, IGCSE and IB boards is an upcoming name among the schools of Hyderabad now and has state of the art facilities to offer to its students for skill development in a wholesome harmonious environment. · Bharatiya Vidya Bhavan Public School – This institution was rated as the best school of Hyderabad by the Indian Express and is famous for its excellence in their teaching portfolio. The several criteria on which a school is judged are qualification/competency of faculty, academic excellence, sports facilities, provision of co-curricular activities and practical education. Different people prefer different combinations for their child. 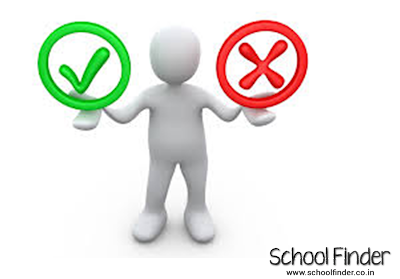 Comparing different schools based on these parameters and then short-listing one is not an easy task! The list is quite exhaustive but informative too. All in all it is a treat for parents looking to send their tiny tots to school. All the information required is available just a click away and that too free of cost. No waiting in line, no sweating in the heat!